How could one show equal movies by size with different and same name names? How could one show equal movies by size with different and same names? Re: How could one show equal movies by size with different and same name names? Note that that video: is a filter, where sizedupe: returns "global" results, so there may be video(s) listed with no corresponding sized "duplicate video" - because the duplicate sized item is something other then video:. Result is a list of all video files that have another video file wih the same size. 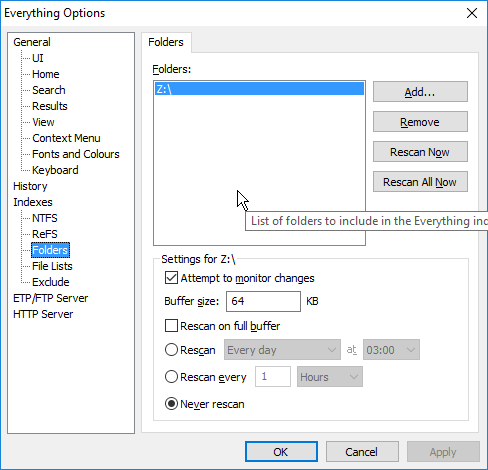 - Close the File List to return to your regular Everything. I don't really get this...I've tried using sizedupe but it shows more or less all the files on the drive, not just the duplicates...with sizedupe on, and searching just my c drive, Everything shows, on my system, 136,478 objects and with it off Everything shows 156,165 objects....Obviously it shows loads of smaller size files which are the same but once the s1ze gets over about 6,000kb it shows all the files not just duplicates. So I guess I can now find the duplicates by sorting by size. Obviously there are shown none duplicates as well. Do I miss anything? How could one avoid the none duplicates to be shown? I assume I have to switch the culumn to bytes to be able to check the file sizes exactly. Is there a shortcut to switch between "Auto" and "Bytes"? (Same number of bytes does not imply "exactness". It only means - same number of bytes. For now, forget about the video: part (& the efu part), simply use sizedupe:. Then sort your files by Size. Are there not at least two of each same sized file listed (& regardless of file type) - IOW, "size dupe's". Now add a filter, say size:>6mb, so sizedupe: size:>6mb. You have filtered your list, so it should be shorter. Not that you may have a .doc file, 6mb & also a .mp4, 6mb. And your .doc may be on C: & your video on D:. Now if you add a D: filter into your search, so sizedupe: size:>6mb D:. With that, your .doc on C: should disappear - you have filtered it out. But the video on D: remains - even though there is no longer any corresponding sized file - listed. There is a corresponding sized file, though it happens to be on C: & your search says to ignore listing (not finding) files on C:. Now what NotNull said, using the .efu export, will take some of the inexactness out of the equation. Depending on one's needs, or understanding, that may be of benefit. 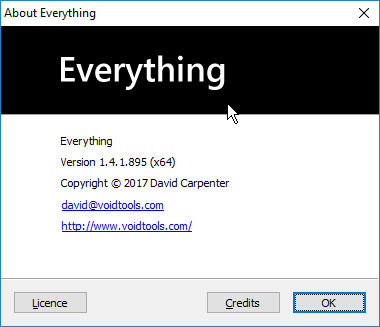 What version of Everything are you running? Yes, sorry, I meant the size of the file to be checked exactly. And yes, I want to check the content of the files finally. So the only possiblity to show video duplicates is doing it by using an efu list? No, the EFU method described only provides you with a more concise listing, with only "video:" files being listed, other sizedupe:'s - those with different file extensions (i.e., !video:) stripped from the listing. One may work just as well for you as the other, though one may be easier to comprehend. This method seems to be the only one working for me. The other ones show many none duplicates. 1) In your first result list - after querying sizedupe: video: and sorting the results by size - in the first 20 or so results there are no results with the same size! That would mean that for those files there *is* a file somewhere with the same size, but that is not a video file! Since some time I do not get notification e-mails anymore. Or sometimes I get them sometimes I don't. What a coincidence. Can Everthing hide those files whose duplicates are filtered / are not video files? Can Everthing hide those files whose duplicates are filtered / are not video files? There's a whole discussion, I think in this thread , where the efu method is discussed. No file sizes are showing in the .efu. 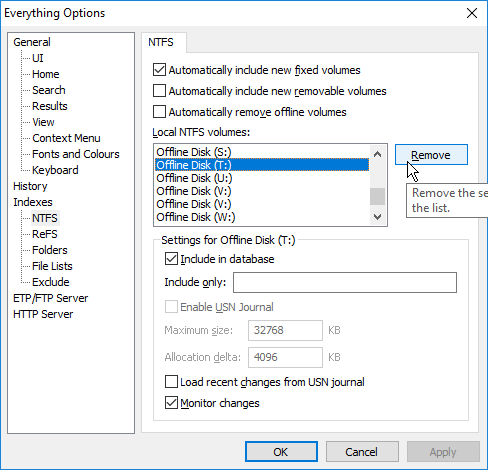 Options | Indexes, is 'Index file size' enabled? Still a mystery to me why it has no size (and no attributes and no dates). Maybe this Z:-drive was indexed long ago, with different settings/Everything version before going off-line? If you search for a couple of those files in Everything itself, are those files showing a date? Something else you could try is connecting this Z:-drive so that Everything is able to index it (again). BTW: is this NTFS filesystem or did you use folder indexing? No, I would not thing so, it is the last drive I bought, the newest, so it should have had the same settings in Everything as the other drives. The most of the files and folders of Z: have a size display, about 1, 2 % or so doesn't. Yes, I do it periodically, it is a back up drive. You have checked "Never rescan" for this Z:=drive. Wait till the scan completes (the highlighted text "Z:\" changes to "Z:\ (rescanning)" during the scan) and disconnect the disk after that. Does that make a difference? Are the missing sizes gone? Yes, that's because (if I remember it right) rescanning the (complete) drive lasts hours or many hours or even longer (a day or more) so Everything would never be able to rescan the drive during the time it is plugged in (because of the file system or so). And that's why "Attempt to monitor changes" is activated to just scan the changes. You should be able to fix that T:-drive by enabling the Enable USN Journal for that disk (and any other NTFS disk). Why fix it? Is there anything broken? USN Journal is unchecked for all of the drives. What is it good for? Why? Each time a drive is plugged in it seems to be rescanned. The reading the USN journal is Everything's way to keep up with changes on that disk. And above all Everything does not scan automatically when the drive is plugged in. Let's summarize first, as there are a lot of open ends in this thread. There were 2 suggestions how to get this done. One - involving an EFU file - brought to light that your files are not completely indexed. This happens on NTFS-indexed disks, as well as on Folder-indexed disks (they use different scanning techniques). IMO that is something that has to be fixed first, as I think the EFU-way is the only 100% accurate method to get what you want. Yes, there obviousy are also single files not indeded on one or more drvies which are not found when searching, did not notice that before. I do not know since when this happens. Yes, yes, of course. And yes, the EFU-way seems to be the only one bringing the correct results. Well then, First step: fixing your T:-drive. Is the missing information now included in Everything? But why just fixing T:? There does not seem to be missing information. May be it is only Z: having the missing data. May be because of that file system. Biff wrote: But why just fixing T:? There does not seem to be missing information. It's a first step and we have to start somewhere ..
Alright. I understand. Thank you. So it is done for T: now. To find those elements with missing information the only thing I need to do is just to sort them by the different columns so the elements with missing informations would be on the top or at the bottom of that column, I assume. And I should do it for each single drive in the same way, I guess. I will do it then. Biff wrote: Alright. I understand. Thank you. Maybe check for missing information first? If there is nothing missing, there is no need to re-scan. Easiest way I can think of (right now) is entering drive: in the search bar (for example T: or W:) file: in the searchbar and sort each column increasing and decreasing (clck on the column header to sort it one way; click again to sort it the other way). If there are empty fields for some files on top of that column, connect the drive(s) where those files are on and follow the steps like you did for your T:-drive. 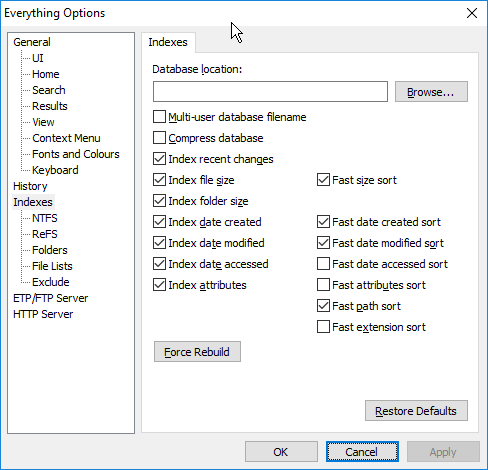 EDIT: Suggestion: When you are done with all disks that needed updating, exit Everything so that the updated database is safely written to disk. Yes. Done, in the way you explained and in others. No missing data anymore. Strange, I only had "fixed" T: having had no missing data obviously. Where did the missing information come from suddenly? Does that also mean that an EFU export now *does* include filesizes, etc? Yes, it does. Any idea why. Hmmm, yes, OK, thank you. Biff wrote: Any idea why. @therube: interesting! Thought this was only when using ES.exe (the command-line tool)? You have configured "Attempt to monitor changes" for this Z:-drive. That means that when Everything is running, it will attempt to detect changes made to that disk. In my experience, Everything does a very good job and detects all changes. But it's not guaranteed. Furthermore: if you connect this (extrenal) disk to another computer and then add/delete/move files on this disk, Everything on your main computer has no knowledge of that and will be 'out of sync'. So, if you use this disk only on this single computer and your Everything is always running, you're probably good. Nevertheless, I think it is a good idea to a "Rescan now" once in a while (let's say once a week). Just to be sure. (*) I thought this was different in older versions; I'll do some experiments this weekemnd. Many thanks! Alright, I understand. Yes, I have added "Filme" separately because a single folder is very much faster (re)scanned, the other files or the most of them is backed up, so not that important to have in the index. Yes, a drawback they are listed twice. Ah, that's great, very excied to get to know. NotNull wrote: (*) I thought this was different in older versions; I'll do some experiments this weekemnd. No, I remembered wrong .. Tested with versions 1.4.1.768 (oldest 1.4 version available) and 1.4.1.877 (first non-beta version). Both vrsions show the files twice; one from Z:\ and one from Z:\Filme. No, no, no reason to say sorry. I could exclude Z:/Filme from the search (not from the indexing). Or the other (backed up) files on that drive.